uuid : d1f5325b-b58f-4ec6-be25-b6ae805dd998 templates_id: 119621 templates_uuid: "18b56f9d-9ed5-4b48-a2b1-5d49e5facd43" title: "Sickness policy | Sick leave policy | Sick pay | SSP" display_name: "Sickness policy" meta_keywords: "Sick policy, Sick leave policy and Sickness procedure" description: "
A sick leave policy sets out the procedures for reporting and managing sickness absence, such as who and by what time employees should report sick-related absence. Employers should use a sick policy to clarify how sick-related absence will be dealt with, to summarise sickness statutory rights and when employees will receive SSP. Use this sickness policy to inform employees how they will be paid during sick-leave, and help them to recognise their personal responsibility to achieve acceptable levels of attendance. What is a sickness policy? 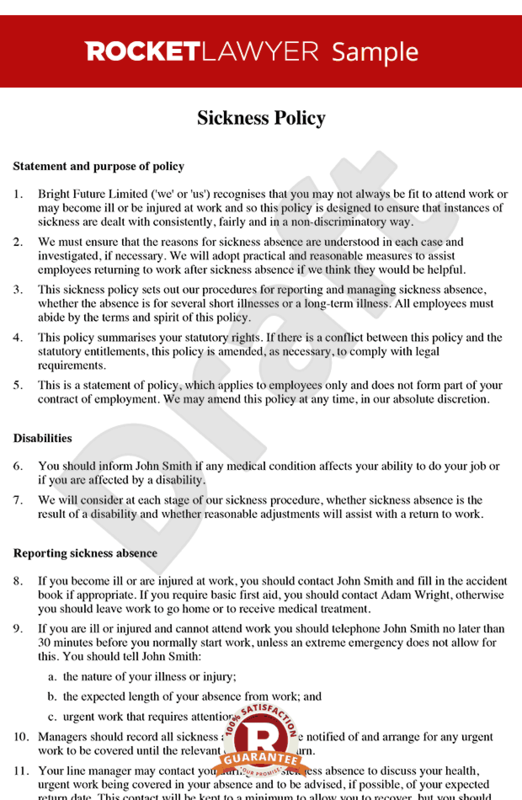 A sickness policy is a document which outlines the policies and procedures an employer has in place to manage sick related absences and the procedure for returning to work for their employees. Do I need a sickness policy? Although there is no legal requirement for an employer to have a sickness policy, it is highly recommended that employers should have a procedure to manage sick absence that employees and staff can refer to. This helps to clarify from the outset the expectations, roles and process so that everyone is clear about their obligations and what action they should be taking. Who should the employee contact to report sickness absence? It is usual for an employer\'s Human Resources department to handle sickness absences from work, or an employee\'s line manager. However it is also possible to use an external organisation to provide initial sickness absence management. What is the first aid requirement? Employers must provide a first-aid procedure at work. Low-risk organisations such as small offices should, at the very least, have a first-aid box and a person appointed to take charge of first-aid arrangements. Employers must provide information about first-aid arrangements to their employees. Workplaces with more significant health and safety risks may need a trained first-aider and to run a health and safety assessment. SSP is the minimum amount paid that employers must pay employees set by the Government. Employees get SSP for the days they would have normally worked. Employees must also satisfy statutory requirements to be eligible for SSP. What are the eligibility requirements for SSP? tell your employer you\'re sick before their deadline - or within 7 days if they don\'t have one. SSP is only available up to a maximum of 28 weeks and cannot be used in conjunction with Statutory Maternity Pay. What if an employee doesn\'t qualify for SSP? An employer will need to provide the employee with a SSP1 form which the employee can use to apply for Employment and Support Allowance. How do I pay SSP? SSP commences on the fourth consecutive day an employee is absent from work. SSP is paid in the same way as normal wages (ie weekly, monthly etc) and tax and NI contributions will be deducted in the same way. What is enhanced sick pay? Enhanced sick pay, also known as contractual sick pay or occupational sick pay, is the company\'s own sick pay scheme which goes above and beyond what is necessary under statute. How much is enhanced sick pay? Enhanced sick pay can be set at any limit on top of SSP, or you can provide full salary and benefits for a set period of time. The contractual sick pay cannot be less than the statutory minimum which is \302\24389.35 per week (information correct as of May 2017). What are the eligibility requirements for enhanced sick pay? This is at the employer\'s total discretion. You can set a minimum period of service with the company before allowing employees to benefit from enhanced sick pay. Should I offer enhanced sick pay? Although there is no need to offer enhanced sick pay, many employers consider company sick pay a valuable part of their benefits package. It can help attract and retain good employees and boosts staff morale and loyalty. What is a \'return-to-work interview\'? A return-to-work interview is an interview designed to welcome an employee back after a certain period of sickness and to check that the employee is well enough to continue working. It is used to find out the reason for the sickness absence and to see whether any changes need to be made. Employees who have been absent for more than 7 consecutive days must give their employer a \'fit-note\'. This note is prescribed by GPs or hospital doctors and indicate whether an employee is \'not fit for work\' or \'may be fit for work\'. A fit-note allows employers and employees to discuss any arrangements and changes that need to be made to accommodate the employee returning to work. What happens if an employee is persistently absent? If an employee is persistently absent and the return-to-work interviews are not helping, then it may be necessary to agree trigger points with your employees, setting out when repeated absences will lead to a formal action. Can I dismiss someone who is persistently absent? Although you may want to dismiss an employee for repeated or extended sickness absences, you have to be aware of unfair dismissal and disability discrimination, especially when an employee may be absent due to a disability-related issue. For more information read Managing sickness absence. What should I do if an employee is off with a long-term illness? Handling long-term sickness absences requires a careful and sympathetic approach, especially if the illness is serious or related to mental health. You may need to add more provisions in your sickness policy to deal with long-term absences or Ask a lawyer.
" created_timestamp: "2018-10-09 06:39:07.0" modified_timestamp: "2018-10-09 06:39:07.0" active: true created_by: 236 modified_by: 236 dcm_id: 343 url_slug: "Sickness-policy" meta_description: "Use a sickness policy to manage sickness related absences. This sick leave policy sets out when employees receive statutory sick pay and other related issues." time_to_complete: "10 minutes"
It is usual for an employer's Human Resources department to handle sickness absences from work, or an employee's line manager. However it is also possible to use an external organisation to provide initial sickness absence management. tell your employer you're sick before their deadline - or within 7 days if they don't have one. What if an employee doesn't qualify for SSP? Enhanced sick pay, also known as contractual sick pay or occupational sick pay, is the company's own sick pay scheme which goes above and beyond what is necessary under statute. Enhanced sick pay can be set at any limit on top of SSP, or you can provide full salary and benefits for a set period of time. The contractual sick pay cannot be less than the statutory minimum which is £89.35 per week (information correct as of May 2017). This is at the employer's total discretion. You can set a minimum period of service with the company before allowing employees to benefit from enhanced sick pay. What is a 'return-to-work interview'? Employees who have been absent for more than 7 consecutive days must give their employer a 'fit-note'. This note is prescribed by GPs or hospital doctors and indicate whether an employee is 'not fit for work' or 'may be fit for work'. A fit-note allows employers and employees to discuss any arrangements and changes that need to be made to accommodate the employee returning to work. More than just a Sickness policy template, our step-by-step interview and guidance makes it easy to create your document. Easily create online, download, print and sign your free Sickness policy in minutes. This document is also sometimes called: Sick policy, Sick leave policy and Sickness procedure.